This is a cigar that you either love or hate. That said, it is arguably the most recognizable Cuban cigar in production today. It's rich and intense taste gives it incomparable style, as its powerful last third covers the palate with spicy and creamy aromas that stay long after the cigars has been laid down. 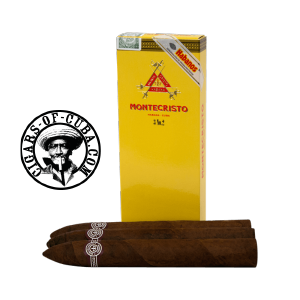 The punchy Montecristo flavors are delivered in an intensive and ever growing manner, giving the Montecristo No.2 true power in a progressive smoke, thus defining it as one of the great Cuban cigars of character. A great classic. If you have already tasted it, you don't need our tasting notes to confirm that you have smoked one of the greatest Havanas. If you have not tasted it yet, what are you waiting for? It has a powerful and a very rich smoke. It's made in many factories around Cuba to satisfy a huge demand. Aficionados of this shape have renewed their patronage to this legendary cigar.